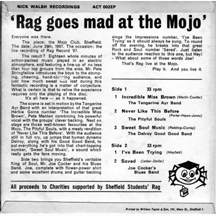 Sheffield University Rag 1967: Joe Cocker: First Time on EP? Joe Cocker: First Time on EP? The 1967 Rag Committee, chaired by Pete Mortimer, introduced a number of fund raising activities that became a feature of Rag Weeks to come. The first Spider Walk took place in that year. And then there were the Rag dances. Twikker Hop that year was a sell-out, and featured Long John Baldry, and, of course, there was Pyjama Jump at Cutlers' Hall - which was certainly nothing like anything I'd seen before, and nor had the city! The Rag Cafe, named The Web, was a hastily converted unit on Wellington Street, the shabby appearance of which was concealed by particularly low lighting. It was non-stop music from 6.00 p.m. till midnight, and basic student fare was available, prominently sausage and chips with baked beans. It wasn't Margie's (a popular eatery close to the Union), but it wasn't at all bad! At times during the week, live music was provided by University group Catch 22, which was later to change its name to Spiral following objections from another group of the same name. 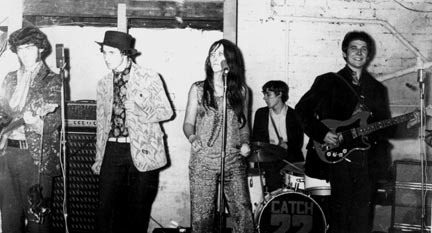 Catch 22 in action at the Rag Cafe, 1967, with Lindsey Young, centre. In 1968, local Sheffield legend Joe Cocker topped the charts with his rendering of With a Little Help from my Friends. Four years previously, Cocker had signed with Decca, but, despite much promotion, his version of I'll Cry Instead failed to make the grade. However, in 1967, he featured on that year's Rag Record, an EP with twenty minutes of music from four then popular local groups. Responsibility for producing the record fell to John Mount-Stephen, ably assisted by Pete Beach. It was recorded live, late in June 1967, at the highly popular Mojo (King Mojo Club) on Pitsmoor Road which was run by Pete Stringfellow (yes, that Peter Stringfellow!) The club was extremely popular with Sheffield youth, and had hosted celebrity groups such as The Move, Pink Floyd, Stevie Wonder and Jimi Hendrix. The record, on the Action label, is a Blues production. There were four acts; two were local town groups - The Pityful Souls and The Delroy Good Good Band - and one a University group, The Tangerine Ayr Band. By far the best contribution came from another local group, Joe Cocker's Blues Band (originally the Grease Band). Strangely, Cocker's two numbers, played to a small but enthusiastic audience, were relegated to Side B. The cover, which looks to have been inspired by the Beatles' Revolver album, was designed by members of the Art College. Some cynics went so far as to suggest that the artwork was better than the record inside, but the package as a whole was far better than anything Rag had produced before. 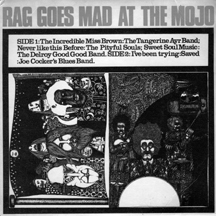 It had been intended that the record's release during Rag Week would be held at the Mojo, with the expectation that it would be heavily promoted and sold at this venue, as well as at the Students' Union. In the event, Rag's association with the club became an embarrassment. Amid claims from residents of drug usage, rowdiness and littering, magistrates refused to renew the club's licence, and it closed two weeks before the record's release. The promotional event was moved to the Students' Union with the result that not all the groups on the disc could participate. As a result, the record was not a huge financial success. It was reported that 1500 copies were required to be sold in order to break even (costs said to be about £350), and it was rumoured that only a hundred or so had been snapped up in the first week. 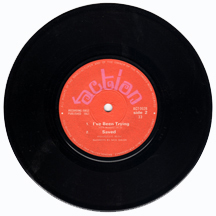 Originally priced at 7/6d (37.5p) - selling at 5s (25p) was considered in order to boost sales - it was still being offered by Rag in 1969, after Joe Cocker's rise to fame. Rag Goes Mad at the Mojo. Action ACT 002, 1967. In 2006, the record was listed in Record Collector at £90, but thereafter dropped to its previous value of £50. It now sells for between £30 - £80 on eBay. As with any production run, there were anomalies. I have a copy with the Side A label on both sides. Note: The memorabilia shown on these pages surfaced during a recent loft clear out!